Determining whether or not to fire an employee can be complicated. There are numerous personnel factors to consider, as well as critically important legal considerations. A single misstep can complicate the process and expose you to a potential lawsuit. But it doesn’t have to be this way! With an eye toward proper progressive discipline in the workplace – and by following some important precautions — you can make the best choices for your business. Lack of solid documentation is the single most common mistake employers make when handling disciplinary situations or terminating an employee. Good records, on the other hand, can mean the difference between winning and losing a legal dispute. In most cases, a progressive discipline policy (and process) will include a verbal warning for the first offense, a written warning if the problem continues, a final written warning and termination as a last step. 1. Concentrate on the incident or behavior. Stick to the facts and don’t include opinions about the employee or comment on personality traits. 2. When describing the problem, don’t exaggerate. Avoid words such as “always” and “never,” unless you can substantiate them. 3. When describing the misconduct, it’s important your documents match previous records. If an employee’s annual review indicates he is “above average,” or “meeting expectations” in every category, it’s difficult to justify a disciplinary report a month later. 4. Document whether the employee has broken a rule, policy or performance standard and specify what it is. It’s easier to justify your actions if the workplace requirement is in writing and communicated to employees. 5. The write-up should indicate what action you will take if the employee doesn’t meet the stated expectations. What will happen? What is the deadline for the problem to be solved? 6. Once you have completed your disciplinary report, go over it with the employee and request a signature indicating he or she has read and understands the content. If you end up having to terminate, you now have the proper performance documentation to support your decision. Terminating an employee is never a pleasant experience, but there are tactics to reduce the likelihood of a post-termination claim – and to make a painful process a little less so. 1. Did I document prior conversations I had with the employee about his performance? Before termination, you should conduct at least one disciplinary meeting to identify the policy or rule the employee violated – and to provide an opportunity to correct the behavior. 2. Does the employee have any “red flags” I should worry about? For example, has he or she filed a workers’ compensation claim? Is he or she a member of a minority group? Did he or she recently return from a medical leave of absence? 3. How have I treated others who engaged in similar behavior? 4. Was there a proper investigation before the decision to terminate? Be sure the employee had a chance to give his side of the story — and that you conducted a proper investigation to support your decision. 5. Should the employee be offered the option to resign and receive a severance agreement? There are circumstances where resignation may be preferred by the employee. 6. Did I prepare all the required paperwork? Double check that all necessary paperwork (termination notice, performance appraisals, written warnings, notes and pertinent correspondence) is complete and ready for the termination meeting. If you’re not sure you should fire an employee, or you believe the reasons for termination are open to interpretation, it’s a good idea to consult with an attorney. Once you’ve asked yourself these questions and decided to let an employee go, you must prepare for the actual termination meeting. This can be nerve-racking, but remember: If you followed your progressive disciplinary procedures, crossed all your “T’s” and dotted all your “I’s,” you’re justified in your actions. • Ensure your documentation is in order (including the termination notice). • Plan what to say to avoid mentioning something you may later regret. • Determine when the employee will receive his or her last paycheck. • Be ready to answer any questions the employee may have about the termination. • List all company belongings to be returned, including things such as keys and ID badges. • Consider the day of week and time of day for the termination meeting. Most experts agree the best time to fire someone is at the end of the day when other employees aren’t likely to be around or the beginning of the day before the employee goes to his or her workstation. • Have a witness present, preferably a member of HR or upper management. • Perform the termination in your office or another neutral setting. • Be clear and straightforward. Tell the individual when the termination will become effective and the reasons for the termination. • Keep the meeting as brief as possible. • Show appropriate sympathy, but don’t praise performance in certain areas to make the employee feel better. • Remove emotion. Never argue with an employee to justify a termination decision. • Have the individual sign a copy of the termination notice and other related paperwork. • Tell the employee how long he or she has to gather personal belongings and leave the premises. • Treat the departing employee with dignity and respect. Although difficult, disciplining and terminating employees are necessary evils in the business world. With a clear approach to progressive discipline in the workplace, you can be confident you’re basing decisions on legitimate concerns – and that you have the necessary documentation to support your decisions. The Progressive Discipline Smart App is an affordable, online tool to help you capture essential details for smarter, more constructive conversations with employees. Proper documentation also ensures fair treatment to all employees, which is crucial in the event of a legal dispute. 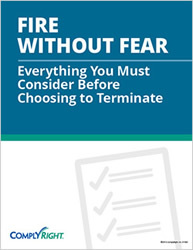 For additional guidance, download the ComplyRight tip sheet, “Fire without Fear: Everything You Must Consider Before Choosing to Terminate”. This practical resource can help you navigate two common firing situations — violation of company policy and poor performance.